Governments worldwide are increasingly focusing on information and communication technologies for development (ICTD), which is not only about developing the ICT industry or sector of the economy but also about using ICT to engender economic as well as social and political growth. Specifically, governments are expected to develop ICTD policy that addresses a range of areas, including an enabling policy and regulatory environment, access to basic infrastructure, accelerated development of basic ICT skills, development of appropriate content and ICT applications for development, and advanced ICT research and development to provide innovative solutions. 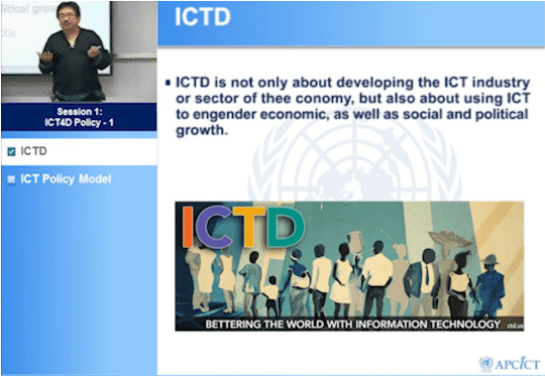 This module focuses on ICTD policymaking and governance, providing critical information about aspects of national policies, strategies and frameworks that promote ICTD. It discusses key ICTD policy and governance issues, and shows how governments can measure their progress and benchmark that progress against those of other countries. Demonstrate how governments can measure their progress in ICTD policymaking and benchmark that progress against that of other countries. Discuss key issues in ICT governance.